When I became aware of Marlise Munoz, a woman who collapsed in her home one morning while 14 weeks pregnant, I went on high alert. Marlise’s story pierced my heart because after unexpectedly collapsing she was brought to the hospital where I was born. That made it personal for me, but I was also deeply worried about her and her pre-born baby’s lives that hung in the balance. Marlise was diagnosed “brain dead” and her husband and family wanted her removed from life support. You see her husband was convinced that she would never want to be kept alive by life support, but it just so happened that Marlise was pregnant with their second child. Texas law forbids the removal of life support for pregnant women and I was so thankful that John Peter Smith Hospital was upholding the law and keeping both mom and baby alive, for the time being. I felt so many emotions as the local and national pro-life community prayed and anticipated the Munoz family’s next move. One on hand a husband and father was demanding that his wife and child be killed, NARAL Pro-Choice America was rallying the hospital to remove life support (one should ask themselves why), yet the pro-life community prayed for this family, and dozens of families offered to adopt the baby. As we waited I was reminded that this was another opportunity to see where this nation stands on the question of life and death. Much like the ABQ election where all eyes watched to see the outcome, I watched to see if this mother and child would be valued in the direst of circumstances. Doctors had planned to keep mom on life support long enough to deliver baby Munoz, which gave many hope. Sadly though the family didn’t desire this new life, they were instead bent on killing Marlise and convinced that this baby would be born with birth defects due to her condition. Don’t get me wrong I do not advocate the removal of life support, I believe we should err on the side of life and never give up hope. Inevitably the system failed this mother and child. Marlise’s family, primarily her husband, challenged Texas law and petitioned the court to be able to remove life support. This is where Marlise’s story gets even more tragic, at the court hearing no one showed up in her defense. The District Attorney did not come to her aid and the aid of her baby to plead their case, the family was unopposed and therefore the judge ruled in their favor last Friday and instructed John Peter Smith Hospital to remove life support by Monday, January 27th. How surreal that the hospital in which my life began is now ordered to kill this mother and child. I must admit that this tragedy brought me to tears, the realization of just how pro-death our culture is hit me hard. We have reached the point where in addition to the daily occurrence of abortion there is an unquenchable blood thirstiness for the death of the most helpless. While these two were literally aborted by a husband, a father, a judge, district attorney and hospital there are lessons that can be learned by those of us looking on. Our battle for all life is first a spiritual one that must be rooted in Christ. Second, we must fight harder than ever before. Lives are slipping away daily across this nation and if we do not rise up in opposition to God’s final enemy, death (1 Corinthians 15:26) we will continue giving God’s enemies the advantage. My prayer is that all who read this real life story will reflect on what you can do to actively end our pro-death culture. I encourage us all to seek brokenness on behalf of the innocent who are brutally killed daily and to ultimately let God mend your brokenness and change you into a person of resolve. Your voice, passion, time and talent are needed in this battle and there is so much to be done. We are getting ready to launch “Protest ABQ” where will be more vocal and visible than ever in defense of the babies being killed in our community because enough is enough. We invite you to join us in this important endeavor, but perhaps you are feeling called to serve elsewhere. Project Defending Life is the leading pro-life ministry in the state and one reason we work with this organization and believe in it wholeheartedly is because day in and day out PDL is there. Project Defending Life is actively reaching out to women seeking abortions and bringing them into the ministry to help them choose life and helping them make a better life for themselves. One of the biggest needs we currently have is for volunteers. Volunteers are needed to run the office and counsel women in crisis situations. Our work on the streets is most effective when we can back up our offer of help to women seeking abortions, but people to meet these women in our office is imperative. Currently the office is open from 10-2pm Monday-Friday (help is needed during these hours). Women and girls need help after those hours though, in fact, last November I went into PDL after 2pm to pick up something and in 10 minutes time I had two teenage clients (who just got out of school) ring the doorbell asking for pregnancy tests. While I had a meeting to be at (and ended up being late to) I couldn’t turn them away. I could only think to myself that if I didn’t help them they would go next door to Planned Parenthood and likely be misled and lost forever. Our volunteers are able to make their own flexible schedule. Please don’t let those who need real help and options be left with only the option of Planned Parenthood and other abortion clinics. Contact Maria to volunteer with clients needing counseling, pregnancy tests and ultrasounds. Contact Jo Ann to volunteer in the office greeting clients and performing other office tasks. 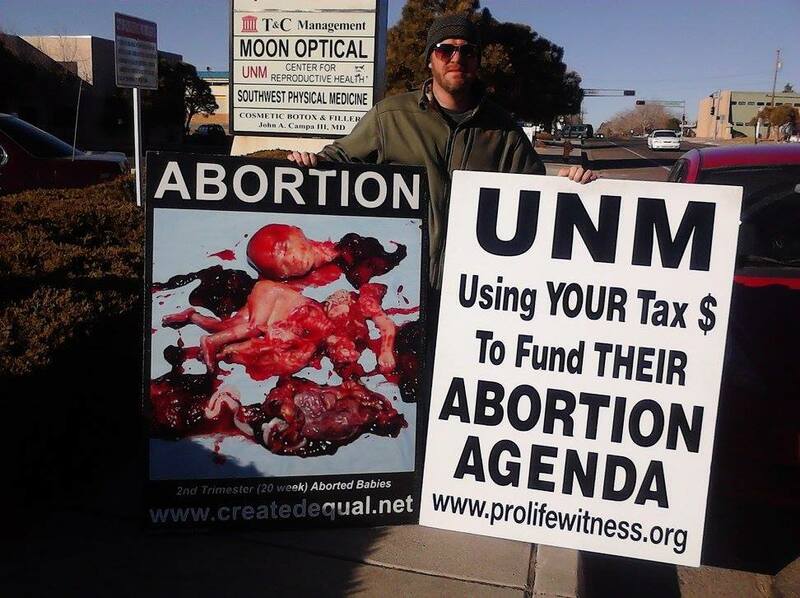 I’m out at UNM abortion clinic UNMCRH on a blustery, cold Mon. in January (13th). The wind has significantly minimized the signs I have displayed. I am holding on to two with all my strength, a very graphic one by Created Equal and one I had made spelling out UNM’s radical abortion agenda. Instead of debating whether the use of abortion victim images has a proper role in the public square, I’m just going to share what I just experienced while I was using them. A woman (45-50 years old) in her car glances over at me as she was leaving another business across the street from UNMCRH and all I heard was her clutch grinding into park. She got out of her car and walked straight over to me…I have witnessed alot over the years but this brought a seasoned activist to tears… while I was still holding on to my signs due to the strong winds, she embraced me and wept profusely for several minutes and then she left. The only words uttered were mine, “God bless you,” as she approached me and again as she left and her groans as she wept, only comprehensible to the Holy Spirit (Rom. 8:26). There is a place for debate, but when debate fails, small steps of faith remain and are what move the mountains. We have been so blessed and humbled to be a part of what God has accomplished in 2013. 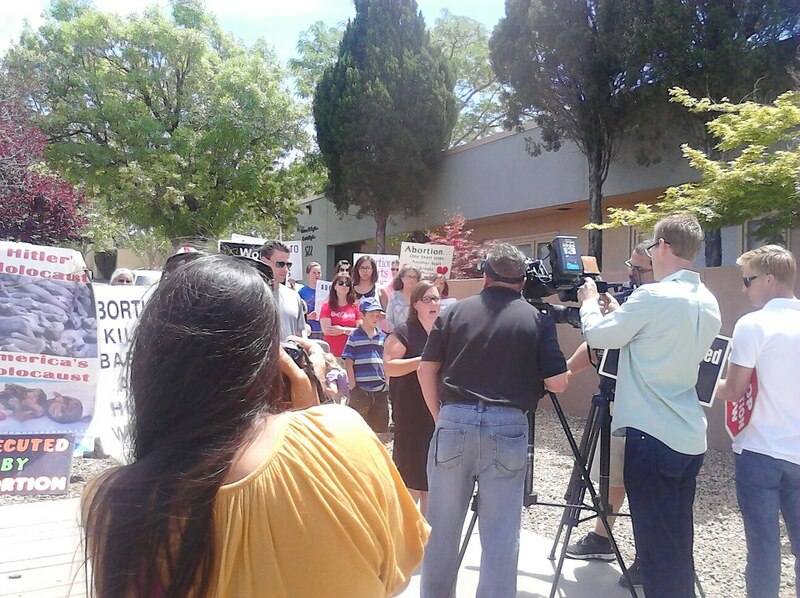 The citizens of ABQ have risen up in big ways and have brought so much awareness about late term abortions out into the open. This city is well on it’s way to seeing an end to all abortions as we move forward sounding the alarm. We appreciate everyone who has stood by us this last year, lifting us up and encouraging us to keep going. A special thank you as well to those at Project Defending Life for continuing to be the most active and comprehensive pro-life ministry in the state and for inviting us to come work alongside them.